PRDnationwide ‘Ready, Set, Go Regional 2018’ report, providing a timely ‘go to’ guide for home buyers and investors on affordable options outside of capital cities. Australian capital cities continue to see positive growth in their property prices, with the December quarter in 2017 reporting median price increases to $769,051 (based on a weighted average median price) and an annual growth of 1.0%. The Australian median family weekly income did grow by 2.3% over the same period of time, resulting in the home affordability index growing by a mere 0.3%. Dr Diaswati Mardiasmo, PRDnationwide National Research Manager, commented: “what we’re now seeing in the market is a diminishing pool of available properties at the lower and mid-price range, especially in the capital cities of Brisbane and Hobart that were once touted as affordable”. Sydney and Melbourne (traditionally unaffordable capital cities) continue to show a high discrepancy between the average state loan and affordable maximum property sale price (average state loan + 20% deposit), of 106.3% and 66.6% respectively. In Brisbane, those with a budget of under $500,000 in the 1st half of 2017 could access 15.3% of the market. This figure significantly decreased in the 2nd half of 2017, down to 10.6% – suggesting further decreasing affordability. In Tasmania for the first time in over 5 years, the percentage growth in the number of first home buyers was negative, suggesting that again affordability is suffering. Affordability - affordable locations are deemed as areas which have a median price below the maximum affordable property sale price (average state loan + 20% deposit). Property trends – to ensure statistical reliability the area must have 20 transactions or more in 2016 and 2017, with positive price growth within that time period. Investment – the area has on-par or higher rental yield than the closest capital city, as well as on-par or lower vacancy rate compared to the closest capital city. Project development – the area has a high estimated value of future project development, with a higher concentration of commercial and infrastructure projects to ensure a positive economic outlook. Unemployment rate – as of ABS Census 2016 the area must have on-par or lower unemployment rate than the state average, to ensure there is local job growth. Out-of-the-box thinking leads to housing and growth options beyond the major capital markets as affordability continues to be an issue. 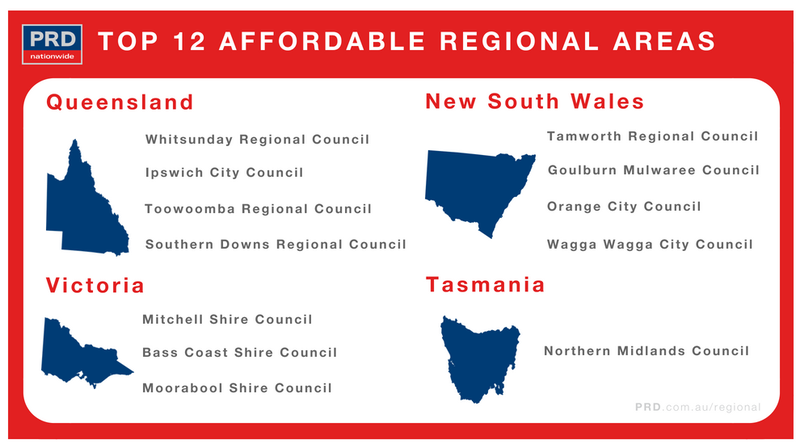 Regional areas, during the past 24 months, have made significant investments in residential, commercial, and infrastructure projects and developments; to create an alternative option for Australians looking to fulfil their ‘great Australian dream’ of owning a home.